Netbooks are an extremely useful breed of laptops especially for those who travel a lot. Most of them are extremely cheap to own too. But there's a catch. Windows 7 is an absolute pain to use in lower spec'd devices and I have realized that newer versions of Ubuntu is not exactly what you want to use in Netbooks. I have been in the look out for the right Linux distro for Netbooks for some time now. Xubuntu 12.04 was near perfect. Ping-Eee OS and Joli OS were not so bad either. Now there is a new kid in the block. Ubuntu GNOME Remix is GNOME Shell in its purest form. 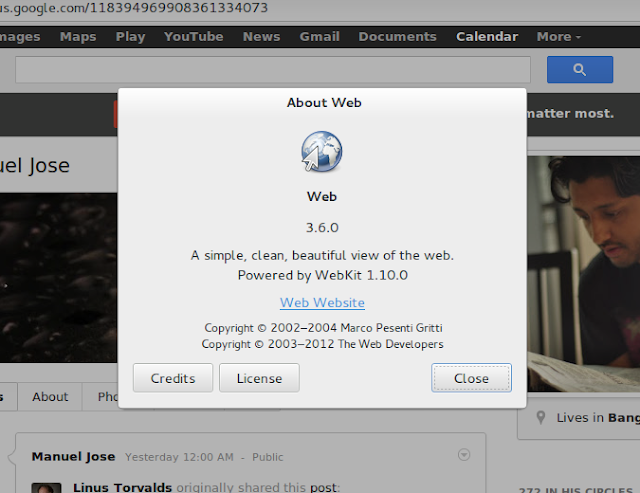 And it is built from Ubuntu repositories. Let's review Ubuntu GNOME Remix. I always loved both GNOME Shell and Unity desktops. They are both unique in their own ways yet very similar in their approaches to common problems. One of the biggest difference between the two lies in their choice of window manager. GNOME Shell uses Mutter while Unity uses Compiz as its default window manager. I have always loved Compiz and was really happy when Ubuntu decided to go ahead with Compiz for Ubuntu Unity. Ubuntu 12.10 Quantal Quetzal has underwhelmed me in more ways than one and I strongly suspect that most of the performance related problems is a direct result of an underperforming Compiz. In this same netbook where I could barely use Google Chrome or Firefox with Unity and Compiz, I am now running Chromium web browser with more than 15 open tabs along with Transmission and Nautilus, and there is not even a hint of lag! But that's a whole different story. Let's concentrate on Ubuntu GNOME Remix and see what is so special about it. Like Unity, GNOME Shell is no cakewalk either. Not everyone liked the new direction GNOME 3.0 was taking. Linus Torvalds once even called it an unholy mess. Since I didn't want to be too far away from Ubuntu eco-system, I always tried to stick with Unity. But I loved GNOME Shell from its very early beginnings. And I knew that, if you want to really experience GNOME Shell, installing ubuntu-gnome-desktop from Ubuntu Software Center will not be enough. And that's where Ubuntu GNOME Remix (UGR) comes in. 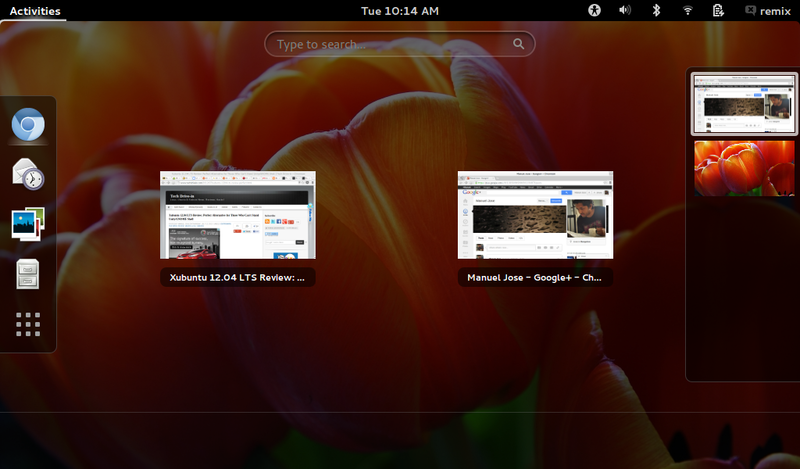 UGR is mostly pure GNOME desktop experience built from the Ubuntu repositories. 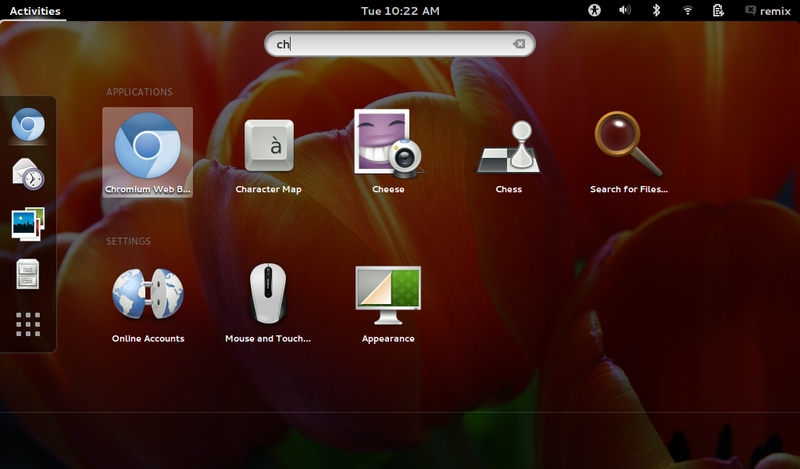 The latest release of Ubuntu GNOME Remix is running GNOME Shell 3.6.1. GNOME Classic is also included in the package and you can install Compiz for GNOME Classic with-effects session. But GNOME Shell will be the default session if your hardware supports it. 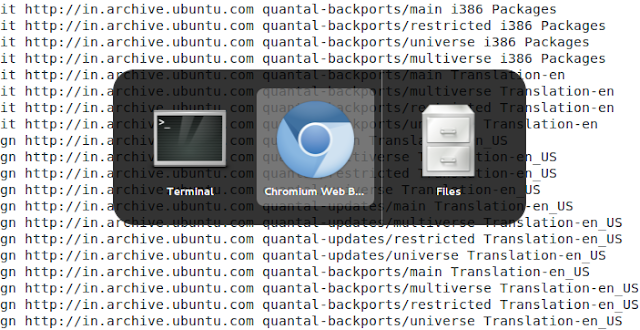 While Ubuntu 12.10 Quantal Quetzal took an unimpressive 38 seconds to boot, Ubuntu GNOME Remix took just 30 seconds. A good 8 seconds lead. May be it has to do something with the apps that come pre-installed. Anyway, both the numbers are still slightly higher than the one that was clocked by Xubuntu 12.04 LTS. But unlike Xubuntu, login-screen-to-desktop time clocked by the two was almost the same. 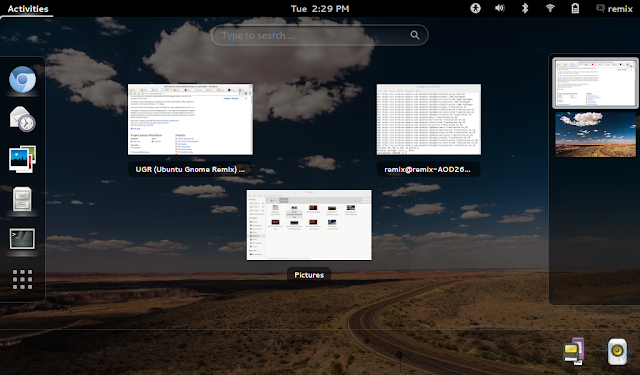 Ubuntu GNOME Remix with its GNOME Shell desktop scores high on usability. Hitting Alt + F1 or Super key brings about the activities menu where you can search for apps, switch between open windows/workscreen etc. And more importantly, it all works very fast. One of the things I didn't like about Activities menu in GNOME Shell is the lack of search functionality for files and folders. You can always open some file browser like Nautilus and then search for files, but that's about it. You can't directly goto a specific folder (for example) directly from Activities menu like in Ubuntu Unity. In many ways, I felt that Unity's dash concept is many times better in terms of functionality, only if its performance is just as good. Integration of notifications in GNOME Shell is near perfect. Unity's notification system pales in comparison. As a matter of fact, Ubuntu's notifications has remained more or less the same ever since it was introduced years ago. It needs an urgent upgrade if not a complete overhaul. Above screenshots are two examples of GNOME Shell's notification system in action. Not only you can dismiss the notification, you can even interact with it and carry out actions like skipping songs in Rhythmbox or unmounting partitions. And you can activate the bottom notification bar by simply scrolling down while at the bottom of the screen. The only thing missing is a more eyecandy notification bar, may be a little dash of transparency will do. New lock screen is a nice touch. But unlocking action can get a little confusing at times. I like GNOME 3's flexible workspace switcher concept, the one without a fixed number of workspaces, which the GNOME Shell has now perfected. It feels very modern. When you hit alt+tab, it shows the entire set of open windows and apps from all the workspaces. Different workspaces are separated by a minimalistic white line. Pretty nifty approach in my opinion. 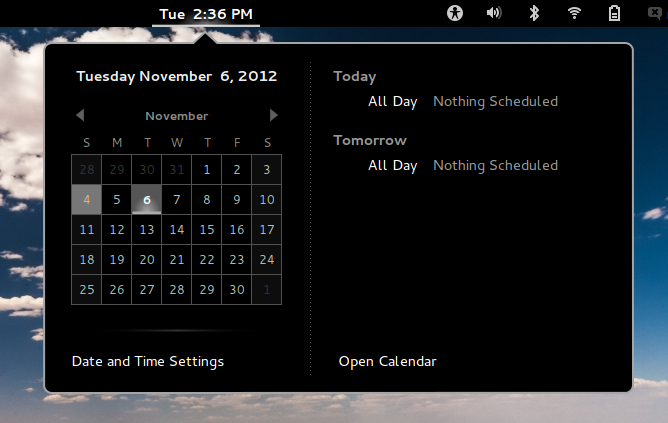 And much better than the "one workspace" approach of Ubuntu Unity. Still no keyboard support for Activities menu while in overview mode. But it's a different story when you are searching for applications. You can easily browse through apps using arrow keys while in Activities menu. 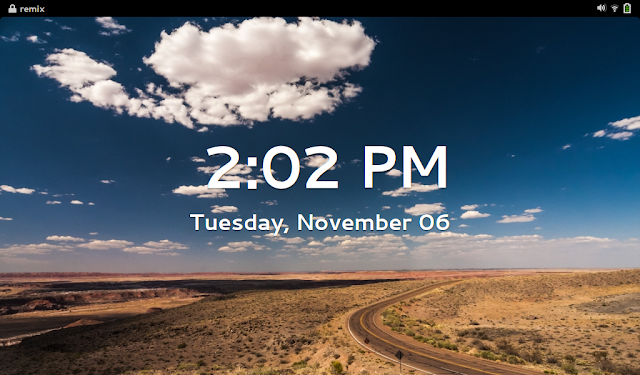 Default time and calendar widget is nice. The only problem is that, there is no option to display date and time simultaneously in the top panel, like in Ubuntu Unity. Restart and Suspend options are still not present in the power button menu by default. While in the menu, you can hit ALT key and reveal Suspend option. Very annoying "feature". 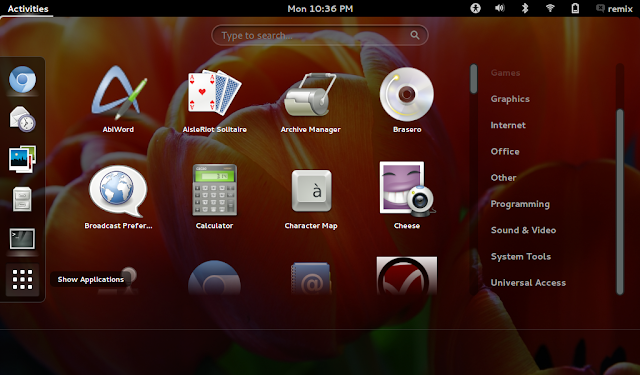 Ubuntu GNOME Remix comes with the sort of applications that are genuinely lightweight and fast to start with. Lets take a quick look at some of them. Epiphany is the default web browser in Ubuntu GNOME Remix. It is a Webkit based browser which is really fast and comes packed with goodies. One thing though, Epiphany does support flash in Ubuntu 12.10. But alternatives like Firefox, Chromium etc. are available for free download in default Ubuntu repositories. So no worries there. There is no Ubuntu Software Center in Ubuntu GNOME Remix. Instead, it has an app called Software (gnome-package-kit), which also includes its own update manager. Like Synaptic, a very simple app that just works and without any fancy animations or effects. GNOME Tweak Tool is present as a default in UGR. 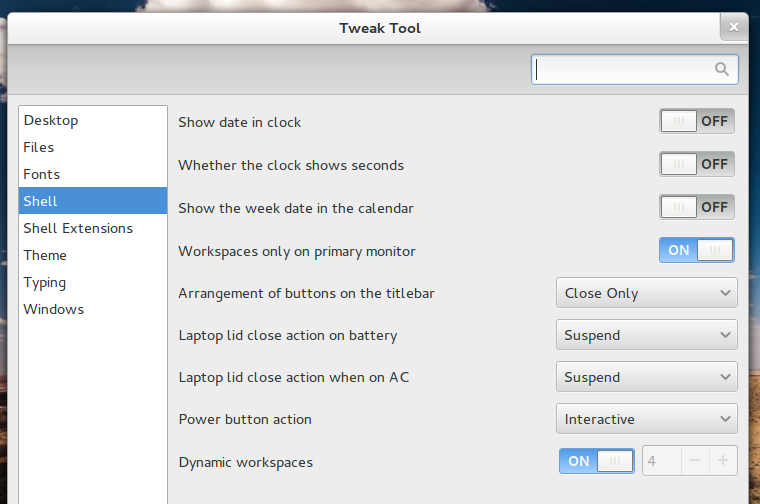 It is the best (if not the only) tweaking tool available for GNOME Shell. As you can see, many settings that are hidden otherwise (like that one for showing date along with the clock in top panel) are all there. GNOME Tweak Tool is such a perfect addition to an already strong collection of applications. Important other applications include: Abiword for word processing, Gnumeric for spreadsheets, Evolution as email client, Cheese webcam app, Gwibber social media client, Rhythmbox music player, Shotwell photo manager, Simple Scan and Transmission. Ubuntu GNOME Remix is my new favorite Linux distro for Netbooks. Period. It is fast, stable and has a very carefully selected bunch of applications as default. Having said that, GNOME Shell and Unity still has a long way to go. But they are definitely in the right direction. Hope they don't mess up their performance in the process. Anyway, it is time to say goodbye to Xubuntu 12.04 LTS for the moment. I am keeping Ubuntu 12.10 Quantal Quetzal as a dual boot though, strictly for testing purposes. Thanks for reading.